If the threatening weather or other tasks prevented you from attending the celebration for Photographs by Eudora Welty on Saturday at the Welty House and Garden (or even if you did! ), you will not want to miss the Wednesday, April 17, History Is Lunch program at the Two Mississippi Museums Craig H. Neilsen Auditorium at noon. Two of Saturday’s panelists, Seetha Srinivasan and Suzanne Marrs, will discuss the new, revised edition of Eudora’s Photographs book. 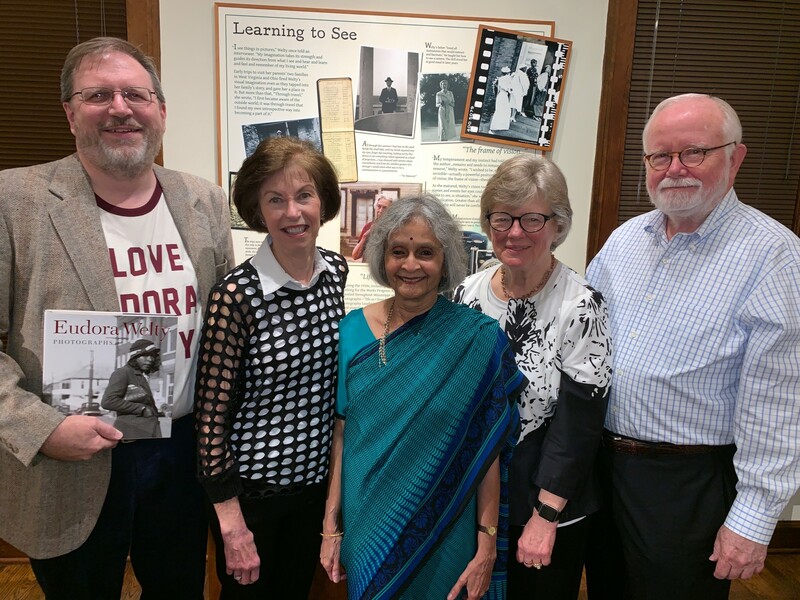 Panelists from Saturday, May 13, Photographs celebration shown above include University Press of Mississippi Director Craig Gill, Eudora Welty’s niece and first Director of the Eudora Welty House Mary Alice White, University Press Director Emerita Seetha Srinivasan, Welty scholar and biographer Suzanne Marrs, and Welty Foundation Board Chairman Holmes Adams. Seetha Srinivasan was director of the University Press of Mississippi when the first Photographs was published in 1989. She and Hunter Cole, at that time assistant director of the Press, served as co-editors and conducted an interview with Welty for the first book, which is also included in the new edition. Welty scholar, biographer, and friend Suzanne Marrs is Millsaps College professor emerita of English. Marrs also worked with Welty in 1985 and 1986 to examine all of her photographs that she had placed at the Mississippi Department of Archives and History in 1964. Marrs helped date them and identify the locations of where they had been taken, setting the stage for the first book’s publication. Two Mississippi Museums is located at 222 North Street, Jackson, MS 39201. There is no charge to attend. Lunch is available for purchase, or you may bring your lunch. Copies of the book will be for sale. For more information call 601-576-6998 or email info@mdah.ms.gov. This post is from the News archive.